An Alberta town is planning to pull a different kind of energy from the abandoned oil and gas wells that ring its outskirts. Hinton, west of Edmonton on the edge of the Rocky Mountains, is teaming up with academic researchers and the private sector to install what may be Canada's first geothermal heating system in its downtown core. And some say it could change the ground rules for industry all over Alberta. "It would be a huge boon for the economy of this province," said Johnathon Banks, a University of Alberta geologist who's working on the project. The town and Calgary-based Epoch Energy propose to re-open an abandoned gas well near the community and use heat from the bottom of the hole to warm municipal buildings. Water five kilometres down simmers at 120 C. It would be pumped topside and used to warm another fluid, which would be piped downtown to the networked buildings. The water would then be re-injected. One study has run the numbers for 12 public buildings, including schools, government offices, the hospital and the RCMP detachment. The $10.2 million cost would be paid back in 16 years at current natural gas prices. The town would cut its CO2 emissions — and associated carbon tax costs — by 3,795 tonnes a year. "It makes sense," said Hinton Mayor Rob Mackin. "We were built on resources and this is just an extension of that." Banks draws a distinction between ground source heat pumps in common use and true geothermal energy. The first, he says, draws on solar energy stored in the top layers of the Earth while the second uses heat actually generated in the depths. 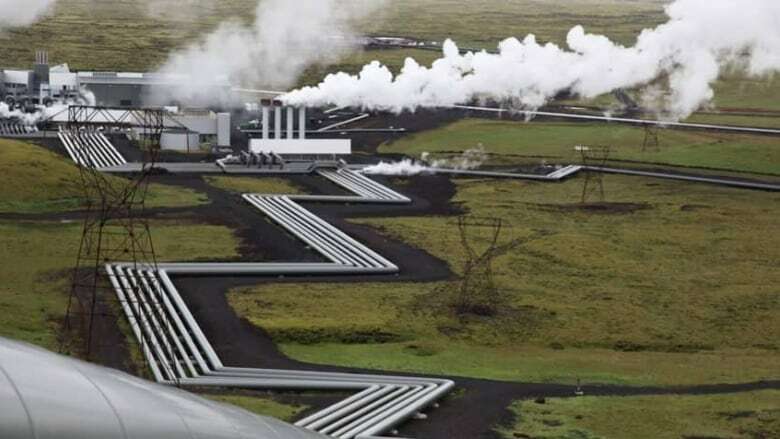 The geothermal concept is widely used around the world, but Hinton's version has a few wrinkles. Rocks beneath the town contain tiny pores which hold oil, gas and water. Pump those pores dry and rocks behave differently. Those differences are well-understood for hydrocarbons, but not water. "When it's related to oil and gas, we know everything," said Banks. "When it's related to geothermal, we actually don't know any of this stuff." Water from that far down is full of salts and other materials such as heavy metals. Will those materials crystallize out at the surface? It's not known. Questions on pump rates, pipe sizes, flow rates and well spacing all need to be answered. The town has asked the provincial government for $1.2 million. Hinton and the university have borne the cost so far. There are also legal and regulatory issues. Alberta has no legal structures for owning heat. A system to encourage oil and gas producers to transfer end-of-life wells to geothermal producers needs to be developed. Transferring environmental liability from oil and gas producers to geothermal producers must be figured out. "There has to be a really fulsome conversation between oil and gas, green energy producers and the regulator to say there's a good outcome here if we can figure out how to do this together," said Lisa Mueller of Epoch Energy. The Alberta Energy Regulator says it is already discussing how to adapt to geothermal, as is the province. If the questions are answered, the possibilities are large. Alberta has thousands of oil and gas wells that offer possibilities. "We would typically look for water above 60 degrees," said Banks. "There's a practically unlimited supply of that in Alberta. There's an ocean of it." Geothermal heat could sponsor a whole new industry — greenhouse agriculture. "If you could go to a greenhouse developer and offer a 20-year fixed-price heat contract, there's a lot of upside there," said Mackin. Communities such as Boise, Idaho, use geothermal to melt snow off streets. Any industry that needs to heat water — such as the oilsands — could let heat from the Earth do the heavy lifting, carbon-free. If everything goes well, Mackin said his town hopes to have the pilot project up and running as early as 2019. If it is, Canada will join the rest of the world. "This isn't new elsewhere in the world," he said. "This is new for Canada." How do we embrace clean energy without disrupting the economy?